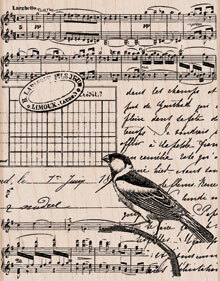 Music, script and a bird combine for an elegant collage stamp. Our woodblock stamps originate from sustainably managed forests. Each design is an imaginative original, and a lasting keepsake. They are hand-cut and assembled by us in the USA.